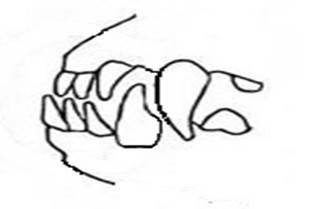 Canine teeth healthy; powerful and wide apart; incisors level, or lower projecting beyond upper but never so much as to become visible when mouth is closed. Functionally the same as a scissor bite as in both cases the jaws are the same length but a level bite differs from a scissor bite in that the upper incisors do not slightly overlap those of the bottom jaw. The upper jaw is longer than the lower jaw. When the mouth is closed, a gap between the upper and lower incisors occurs. The lower jaw is longer than the upper jaw. When the mouth is closed, a gap between the lower and upper incisors occurs.